A luxurious fish dish, Applaws Adult Ocean Fish with Salmon offers your adult cat a complete, balanced nutrition. The recipe is based on the natural diet your cat would eat in the wild, full of valuable protein and completely grain-free. This dry food contains the highest-quality delectable whitefish and salmon. This makes up 50% of the recipe, including 26% fresh fish, and offers your cat valuable animal protein that can be put to good use throughout the body. Salmon is particularly succulent and also provides a range of vital unsaturated fatty acids, as well as having low allergenic potential. By feeding your cat a protein-rich diet, you are imitating the kind of food they would be eating in the wild and meets all of your cat's nutritional needs. That is why Applaws Adult Ocean Fish with Salmon is 100% grain-free, making it highly-digestible and suitable for even the most sensitive of cats. 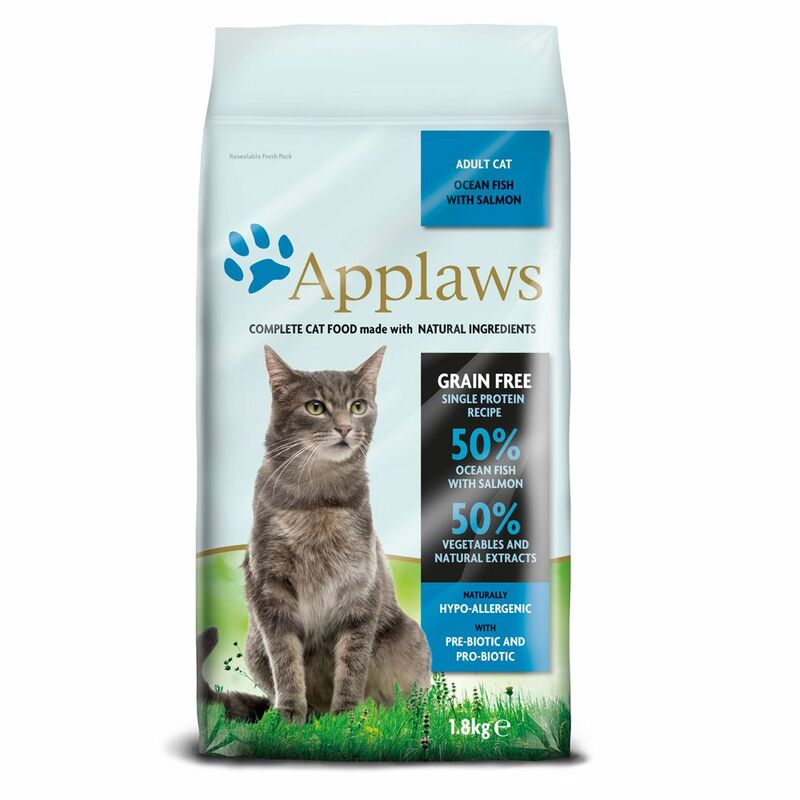 Applaws is well-known for having extremely high quality standards for all of its ingredients, which is why this delicious complete food contains no animal by-products, instead using only top-quality fish fillet. This ensures that your cat is receiving only premium protein. The recipe also contains functional ingredients such as prebiotics and beet pulp, which support the digestive system. Salmon oil also features in this food, full of valuable omega-3 and -6 fatty acids and a great way to keep your cat's skin healthy and fur gleaming. Applaws dry cat food is completely free from artificial additives. Natural selenium and tocopherol are antioxidants used to naturally preserve this food, as well as providing numerous health and vitality benefits. Applaws Adult Ocean Fish with Salmon Dry Cat Food at a glance: Complete food for adult cats Ideal for cats suffering from allergies or dietary sensitivities 50% fish content (including 26% fresh fish): a source of eΒential animal protein for your cat to put to good use around its body High quantity of vegetables and natural extracts: full of valuable fibre, vitamins and minerals With salmon: a particularly delicious fish, rich in omega-3 and -6 fatty acids and with a low allergenic potential 100% grain-free: cats find grains difficult to digest. There is also little use for them within the feline body and an exceΒ can lead to obesity, diabetes or problems with the liver or pancreas Finest quality ingredients: ensuring there is no need for animal by-products or artificial additives With cranberry: this ingredient offers natural antibacterial effects and is particularly beneficial for protecting mucous membranes in the stomach and urinary tract against infection With coconut oil: this can be quickly and efficiently converted into energy, thanks to medium-chain triglycerides, and does not contribute too highly to body fat deposits Yucca Schidigera: this can reduce unpleasant stool odours, as well as supporting a healthy gut flora Prebiotics: to regulate your cat's intestinal environment, soothe the digestive tract.